Like with any styling, it helps to have a plan — what mood or theme do you want to achieve? Creating your colour palette for your bedroom is so very important. We spend most of our time in our bedrooms…..Well mostly sleeping but none the less you want the space to be relaxing, fresh, inviting and calm. You might like to use some of this season’s’ it' colours…..Or would you prefer a soft and romantic palette? Blush pink and soft grey is a winning combo right now. Enjoy our themed rooms this week. Bec had a fun experience designing and customising most of these stunning bedheads for her Gold Coast clients. Creating a bedhead at Tailored Space Interiors is a simple as this…. 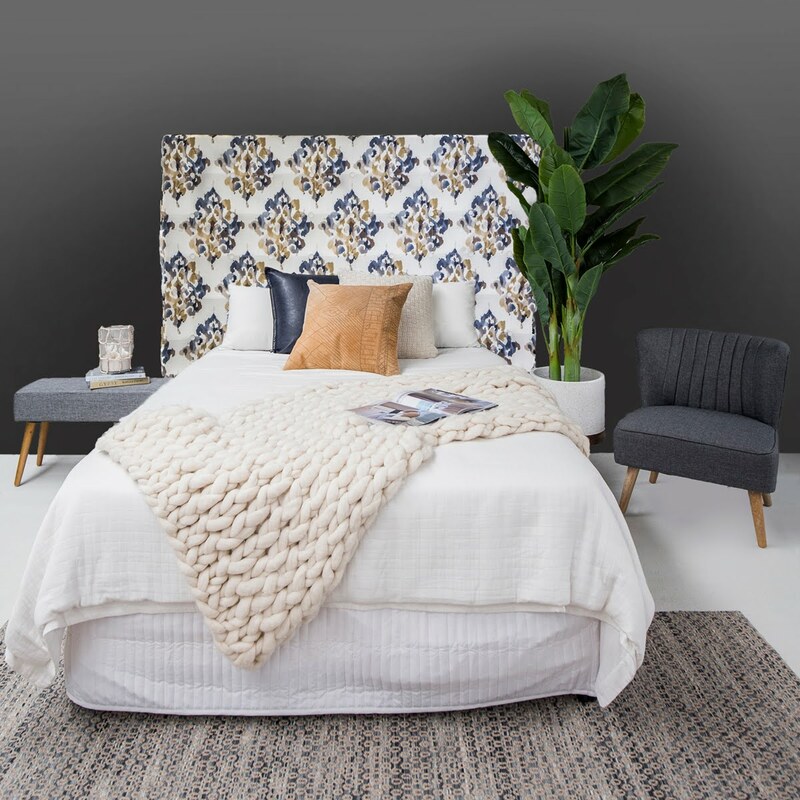 All accessories pictured in these stunning styled bedroom shots by Tanika Blair are available online & in store to purchase. Or ask us about our in-home consultations. We can help you create your dream bedroom. This custom queen buttoned bedhead is featured in the Warwick Fabcris, Lindeman Steel and works back so well with so many different sofa colours. To create this look at home, shop our products using the links provided ……. 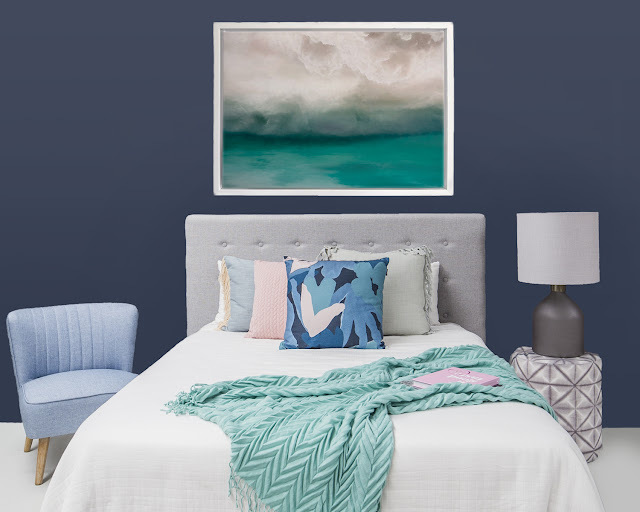 ‘The Wait” canvas artwork, custom side pod priced from $225, scatters cushions, Abstract Floral in front $57.95, Cameo soft pink $24.95, Fringe mint cushions priced at $54.95 and the Madison bright mint throw priced at $49.95. This double bedhead featured in Warwick Fabrics 'Jarvis Denim' is a favourite of ours. Custom made for local clients & styled in store before delivery. Featuring the Penny occasional chair in charcoal, priced at $330.00, Hunter Oak Floor lamp with the too cute table attached priced at $359.95. Custom made 100% wool throw, our New Inky cushion priced at $135, the Boston navy leather look cushion $61.95 and the Swell Regal canvas artwork priced from $378…..Create this entire look by Tailored Space Interiors in your home now. This King bedhead featured in Warwcik Fabrics 'Akari Indigo’ is a stunning master bedroom feature. It’s sophisticated yet elegant. Add the following to create this entire look; Penny deco chair $330, Scando bench priced at $99.95, custom made wool throw, Boston navy leather look cushion $61.95, Orian tan leather cushion $189.95, our banana tree sitting pretty in the heal planter priced from $199.95 for the planter & $299.95 for the artificial banana tree. This Provence bedhead featured in a soft grey fabric is apart of the new bedhead range available at Tailored Space Interiors. 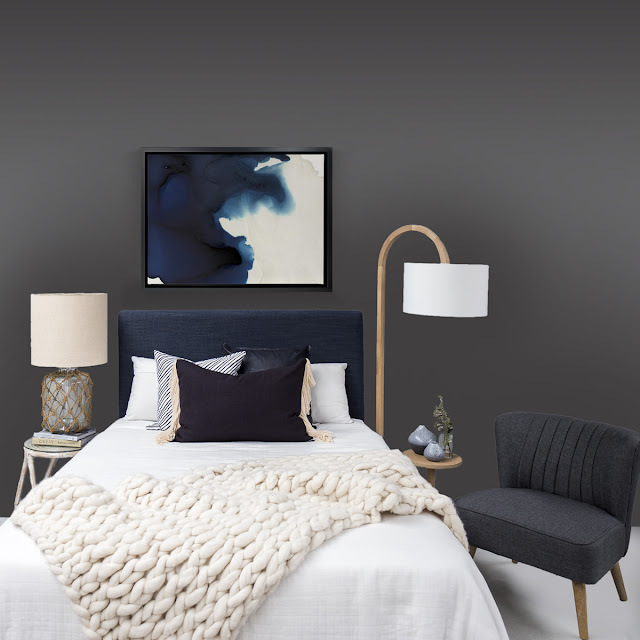 This bedroom also features the new Halfback textured throw in grey (130x170cm) $119.95, the stunning ‘Byron’ framed artwork from $680, cameo cushion from $24.95, Casper grey cushion $79.95 and the Inky cushion $135.00, the Hunter Oak floor lamp with side table priced at $359.95 and the Cambridge blue bedroom chair priced at $580.00 our banana tree sitting pretty in the Heal planter priced from $199.95 for the planter & $299.95 for the artificial banana tree. 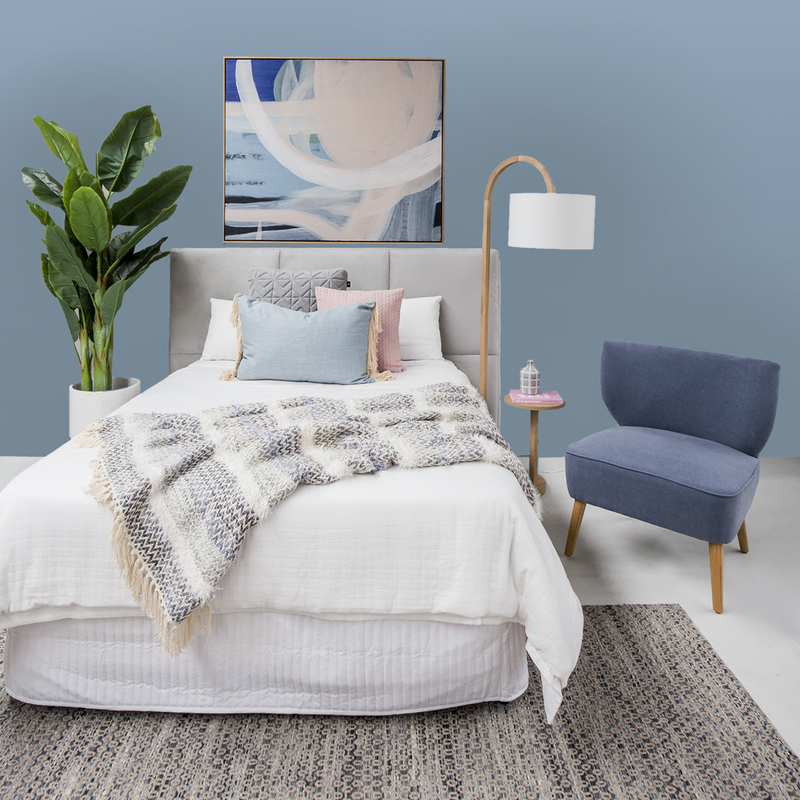 We hope you'll enjoy our bedroom designing & styling tips over on our instagram and facebook through the next 2 weeks. We sure have enjoyed putting them together for you.